by Kate’s Krew – The story of Kate’s journey by her family. Our family has been following and supporting Kate and other Cancer children. Please take time to read, go to her website and provide whatever support you can. Their smile is bright and the support of all gives them HOPE. I told my mom yesterday that a blog post was forming. That I couldn’t concentrate because so many thoughts were spinning around in my head…I just needed to WRITE. But I can’t. I have nothing to put down in a blog that conveys the profound sadness I feel over losing yet another beautiful young soul to this terrible disease called cancer. There are some people…in this case, children…who you meet that you just think “oh! They’re the one who will defy odds! She will be the one who will live beyond doctors’ wildest expectations! He will be the first one cured!” These kids, wise beyond their years, steal your heart with their pleas of more funding, better research…a cure. But the thing that makes it even more painful is that they’re not just doing it for themselves. They’re doing it for the other kids just like them, whose diagnosis might NOT be terminal from day one. Maybe, just maybe, their voices will be heard and they will be the ones who make it so that YOUR child doesn’t have to suffer their same fate. 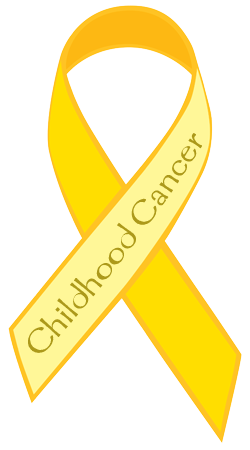 Today is September 1st and it’s the first day of childhood cancer awareness month. Today I will mourn the passing of another beautiful child gone too soon, who is now dancing around the golden heavens with her other friends…also taken too soon. Children should never make their way to heaven at this age and they CERTAINLY should not be met by other friends of the same age. This is why we need more funding, better research and a CURE. Nature’s first green is gold, Her hardest hue to hold. Her early leaf’s a flower; But only so an hour. Then leaf subsides to leaf . So Eden sank to grief, So dawn goes down to day. Nothing gold can stay.